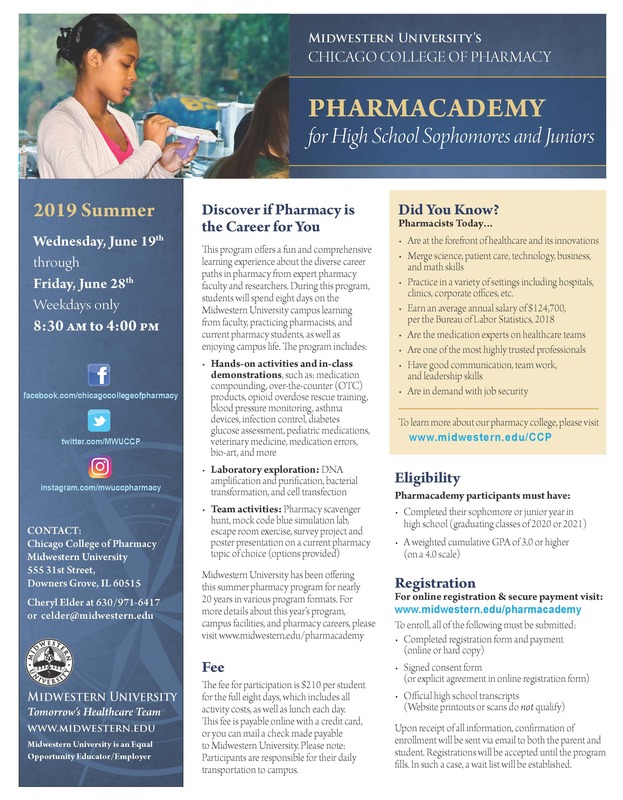 This program offers a fun and comprehensive learning experience about the diverse career paths in pharmacy from expert pharmacy faculty and researchers. During this program, students will spend eight days on the Midwestern University campus learning from faculty, practicing pharmacists, and current pharmacy students, as well as enjoying campus life. Hands-on activities and in-class demonstrations, such as: medication compounding, over-the-counter (OTC) products, opioid overdose rescue training, blood pressure monitoring, asthma devices, infection control, diabetes glucose assessment, pediatric medications, veterinary medicine, medication errors, bio-art, and more. Laboratory exploration: DNA amplification and purification, bacterial transformation, and cell transfection. Team activities: Pharmacy scavenger hunt, mock code blue simulation lab, escape room exercise, survey project and poster presentation on a current pharmacy topic of choice (options provided). Check out the website for more information!